Ballast not included. Recommended 700 lbs. 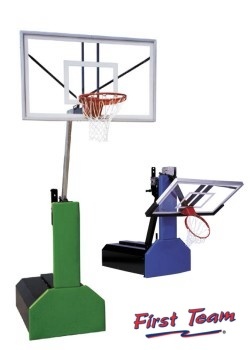 The Thunder portable basketball goal is an excellent choice for any school gymnasium, recreational complex, multipurpose facility, or church in need of a high quality portable while working within a budget. The Thunder is adjustable. Its simple to use hand crank allows for infinite height adjustments from regulation 10' down to 6'. An easy to crank adjustment handle on the backside of the unit telescopes the backboard and rim to the desired playing height. One person can easily move the Thunder portable goal. An easy to grip release crank unlocks the brake and six roller wheels contact the playing surface for smooth portability. The extension arm can be quickly dropped down to allow the unit to pass under any standard height double doors. The distance from the backboard to the base of the unit is 4' with the rim at the regulation 10' height. This allows the base of the unit to sit "off the court" for player safety. Heavy foam padding covers the entire front of the unit for additional safety. Padding is available in several colors. The unit is durable and stable enough to withstand slam dunk action and will not tip over when players hang on the rim. This allows the unit to meet an array of facilities and budget needs. BALLAST NOT INCLUDED: This system requires a recommended 700 lbs of ballast.